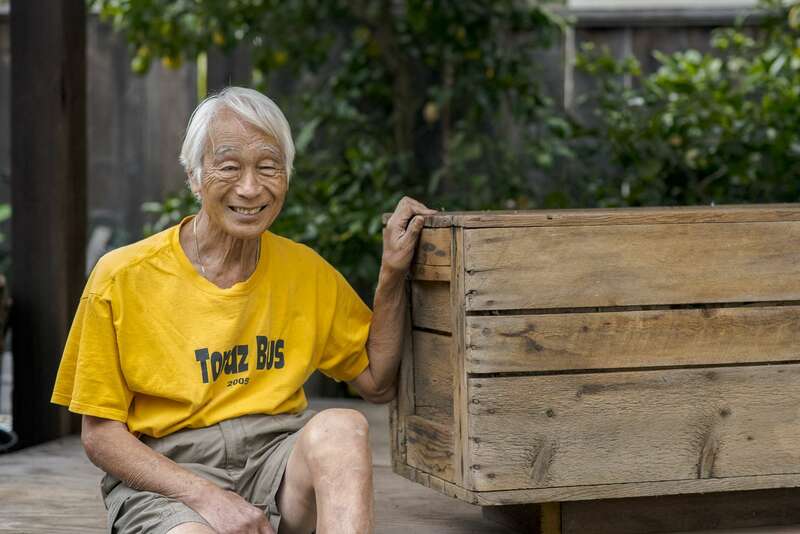 Former Topaz incarceree Toru Saito with the mystery box in his Berkeley backyard. Among the thousands of men, women and children who prepared to depart the Topaz concentration camp in 1945 was someone with a hammer who packed a large box made of wood planks and then nailed it shut. The Utah camp closed and the box was given for safekeeping to a Berkeley man who stored it for 54 years in his garage. No one ever reclaimed it and there is no identifying information on the crate. The Berkeley man eventually passed it on to his neighbor, Toru Saito, for safekeeping. For the last 18 years, Saito stored the box but never opened it. Meanwhile, the neighbor passed away. The box weighs 87 pounds. It has sat unopened for 72 years. On April 24, the Topaz time capsule will at last be unsealed in Delta, Utah, in a ceremony before survivors, descendants, the town mayor and townspeople because “now is absolutely the right time to open it,” Saito says. He is bringing the box to Utah on a five-day, 1,500-mile round-trip bus trip with 40 pilgrims from the Bay Area and Sacramento. The new Topaz Museum is holding its grand opening in Delta on July 7-8, he says, and this year also marks the 75th anniversary of President Roosevelt’s signing of Executive Order 9066. “Seventy-five years is a landmark year, like 50, 75, 100. I don’t know if I’ll be here in another 25 years and I thought this would be a good opportunity for those who are still alive and who are still interested in what we went through,” Saito said. Saito has mused for years about the mysteries the box contains. A San Francisco native, he spent nearly four years of his childhood at Topaz, with his mother and four siblings, in Block 4, Barrack 10, a place he has returned to multiple times to understand his family’s history and the injustice of having one’s freedom taken away. On hand to witness and report on the box’s opening for a new website is a research team that received a National Park Service grant to create a digital display of objects and stories related to the wartime incarceration. 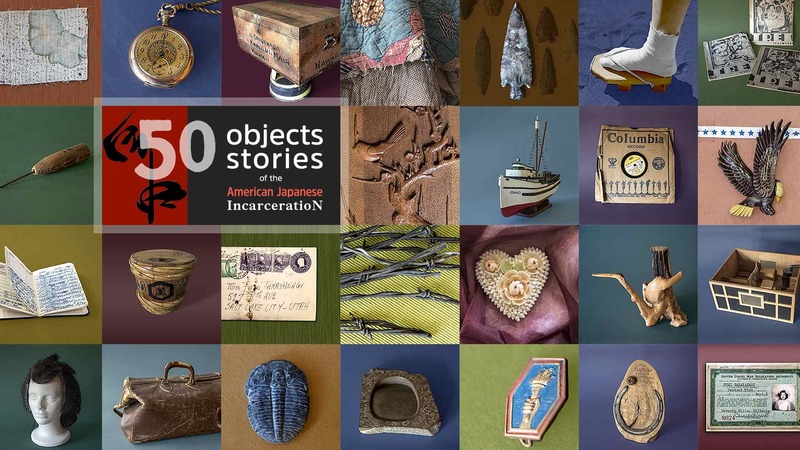 The project, titled “50 Objects/Stories of the American Japanese Incarceration,” will report on the opening of the Topaz box on its website before formally launching a curated collection of 50 artifacts, one by one, that will tell multimedia stories about the wartime imprisonment of 120,000 Japanese Americans. Updates will be posted on Saito and the box’s return to Topaz on Facebook (http://facebook.com/50objectsNikkei). “This history is still within living memory, so it’s possible to preserve the stories for future generations,” said project director Nancy Ukai. The proposal was awarded a 2016 Japanese American Confinement Sites grant. The project team includes Bay Area artist David Izu, filmmaker Emiko Omori, and writer Chizu Omori. Ukai will be among the pilgrims on Saito’s bus. The trip is the sixth in a series of pilgrimages that Saito has led since 2002. Wearing a saffron yellow “Topaz Bus 2005” T-shirt, Saito ran his hands over the weathered planks of the box, mulling his plans to remove the planks using a Japanese saw he purchased for the occasion. The box’s opening will be facilitated by Dr. Satsuki Ina, a filmmaker (“Children of the Camps”) and psychotherapist whose parents were incarcerated at Topaz. She will reflect on the journey of the box in the evening program. The evening will begin with a taiko drum performance by Jerry Furuzawa, Ruth Ichinaga, Kaz Iwahashi, Akemi Yamane and Kiyoshi Ina, who was born at Topaz.